Female House Sparrow (Passer domesticus) in Leeds Castle, Kent, England, 24 May, 2009. Sparrows are some of the most familiar and most common birds in the world, but what is a sparrow? Knowing what makes a sparrow a sparrow can help birders identify these birds more easily and better appreciate their place in the world's avifauna. The term "sparrow" covers a wide range of relatively small, mostly drab brown birds, which birders often call "LBJs" or "little brown jobs" because they can be notoriously difficult to identify. While many of these birds include the word "sparrow" in their common names, other types of sparrows include buntings, towhees, and juncos. In fact, there are dozens of different sparrow species throughout the world—more than 50 of which are found in North America. Understanding how these small birds are related and what similarities they share is helpful for understanding their uniqueness in the avian world. Sparrows can be found on every continent except Antarctica, and they are generally divided into two principal families. Old World Sparrows: These sparrows are types of weaver finches in the family Passeridae, and they are widespread in Europe, Asia, and Africa. One of the most common sparrows—the house sparrow—is an Old World sparrow and has been introduced widely around the world, so much so that it is considered an invasive species in many areas. Other sparrows in the Passeridae family include the chestnut sparrow, Somali sparrow, and rock sparrow. New World Sparrows: These sparrows are common in North and South America and belong to the family Emberizidae. There are dozens of sparrow species in this family, all with subtle differences in appearance, habitat, and range. Some of the most familiar species include the song sparrow, swamp sparrow, field sparrow, eastern towhee and American tree sparrow. In both of these bird families, sparrows have evolved a wide range of species to fill different ecological niches. Sparrows can be found in nearly every habitat, from deserts and arid grasslands to marshes, forests and even urban areas. Because of this diversity, understanding sparrows is essential for serious birders. Size: The majority of sparrow species are relatively small, with sizes ranging from 4-8 inches in length, though 5-7 inches is the most common range. The size proportions, such as head size relative to body size or the tail length compared to over measurements, also vary. Plumage: These birds are called LBJs for a reason, and most sparrows have brown mottled plumage that serves as superior camouflage. They often have several distinct markings on the head, however, including stripes or bold colors that stand out from their bland bodies. Bold black, yellow and chestnut markings are common on many sparrows. Bill: A sparrow's bill is relatively short and thick with a conical shape. This is perfect for cracking the seeds that are these birds' primary food source. The bill color often varies, however, with some sparrows having dull gray or blackish bills while others have pale yellow or pinkish bills. Flocking: Like most songbirds, sparrows are solitary or found only in pairs or family groups during the spring and summer breeding season. In autumn and winter, however, they will form mixed flocks of different sparrow species, and may even be mixed with some other small birds such as wrens or chickadees. Birders can take advantage of this behavior by scanning complete flocks in the field to see if any unusual species are joining more familiar birds. Foraging: While foraging, sparrows feed primarily on the ground or low in trees or shrubby cover. They will often glean through leaf litter for seeds and insects, and many sparrow species will hop to scratch with both feet while feeding. This scratching also creates noise that can help birders better locate sparrows in dense thickets or shrubbery. Diet: Sparrows are principally granivorous seed eaters, though they also consume a fair amount of insects. This is especially true during the spring and summer when the protein from insects is essential for growing hatchlings. 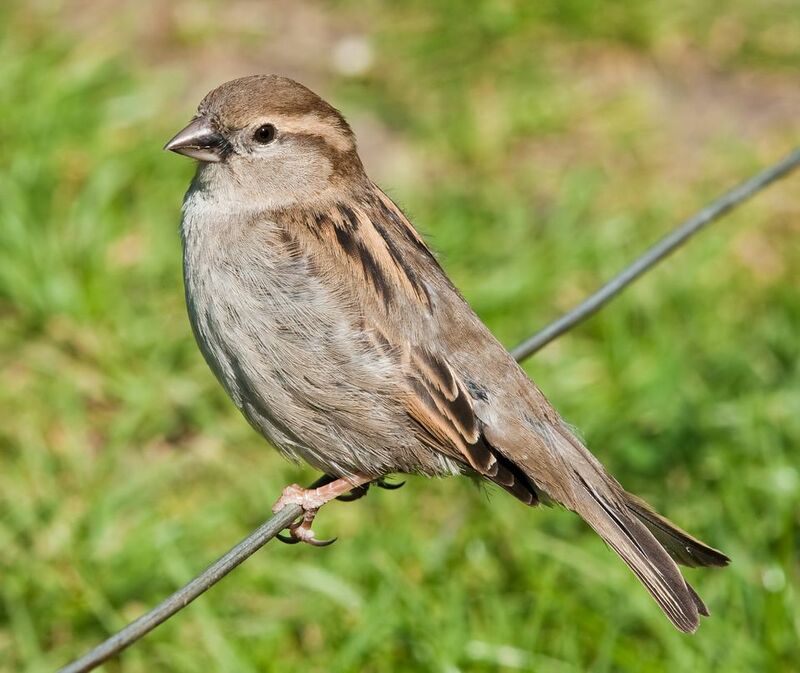 In the backyard, sparrows are fairly undiscriminating and will eat black oil sunflower seeds, millet, cracked corn, milo, bread scraps and a range of other foods. Flight Pattern: Sparrows are fast, agile fliers that use a series of rapid wing beats followed by a brief glide with folded wings to create an undulating flight pattern. As flocking birds, they may be easily startled and may fly between a food source and shelter frequently while feeding. Above all, sparrows are adaptable birds. With a wide range of species found all over the world, these birds are a staple on every birder's life list and understanding what makes sparrows unique can help all birders better appreciate these LBJs.